Fishing is a major industry in almost every country, but fishermen don’t always catch exactly what they are aiming for. The animals that are not target species are referred to as ‘bycatch’ and are usually discarded. Although there are many different types of animals that are mistakenly caught in fishing practices, seabird populations are one of the most severely affected because they are usually completely discarded. Bycatch is the term used for animals that are caught by fishing practices by mistake. Animals such as seabirds, sea turtles, non-target fish species and some marine mammals are all caught by fishermen. With the right permit, a non target fish can be taken home by the fishermen to be eaten, but other animals are usually just discarded. This is the problem with bycatch because the discarded animals are either already dead or they are injured in a way that gives them limited chance of survival. While these dead and injured animals can become food for another animal, they aren’t able to contribute to the reproduction or growth of their own populations. Seabirds are at large risk because they are attracted to fishing vessels as part of their foraging behaviors. Though all of these are impacted by overfishing and the fishing industry, seabirds are greatly impacted and are becoming increasingly threatened by long lining in particular . Different species are caught in different ways. Mammals are usually caught in nets, but long line fishing catches more than just target species of fish. Sharks, turtles and seabirds are all attracted to the bait on the lines of long line fishing. Seabirds get caught on the lines and drown. Procellariiform birds, such as Albatrosses, petrels, fulmars, and Shearwaters are particularly vulnerable due to their foraging patterns, as detailed below . Since they can't be used by the fishermen, seabird bycatch is gets thrown back into the water. 17 of the 22 species of Albatross are listed as vulnerable, endangered, or critically endangered by the IUCN (International Union for the Conservation of Nature) . It is estimated that tens of thousands of seabirds are killed every year in longline fisheries . The loss of birds through bycatch contributes to population declines that are already affected by habitat loss, pollution, nesting site disturbances, disease or shifting patterns of food availability . For more on the effects of fishing on populations click here. Why are Seabirds at risk? Albatross are frequently caught in longlines because of their behavior. These large birds spend the majority of their lives out at sea, gathering on land only to breed . They feed primarily on squid and schooling fish, but they have been known to follow fishermen in hopes of catching leftovers . Since they are Procelariiforms, meaning they can dive to catch prey, they are able to catch fish on lines easily . 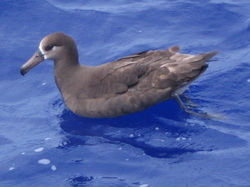 Shearwaters are also Procellariiforms, similar to Albatrosses. They can also swim underwater by using their wings to propel them . They also feed on squid and fish. They tend to follow fishing boats, hoping to find scraps, and this is how they get caught accidentally . Both petrels and fulmars are Procellariiforms, so they also dive into the water to catch prey such as fish and squid. Petrels are pursuit divers and they feed mostly on krill, copepods and some amphipods. Fulmars are also well known to commercial fishermen for their avid scavenging of offal thrown from boats . Gulls are in the family Laridae along with Terns. They are opportunistic feeders and can be found out at sea where boats fish, but they spend most of their lives near the coast . They do not dive like Procellariiforms do, but it is their voracity in which they catch anything that looks edible that makes them at risk for longline fisheries. How are Seabirds Incidentally Caught? While bycatch occurs with every type of fishery, seabird bycatch occurs through two main practices. Since seabirds feed on fish near the surface, and some dive to depths of up to 3m or more, longlining is the most common way that birds are caught as bycatch. Longlining is a fishing practice where a central fishing line ranging from 1 to 50 miles long is strung with smaller lines of baited hooks spaced at even intervals. These lines can be either pelagic or demersal, depending on the depth at which they are released . Pelagic longlining catches pelagic fish, hence the naming 'pelagic' and Demersal longlining is a practice that catches fish that dwell deeper . Tuck et al reports that longline fisheries catch substantial numbers of seabirds and this has potentially significant conservation implications . If this mortality is not reduced, numbers of breeding birds in populations will continue to decline, which threatens the long term viability of the seabirds . This is a depiction of Long lining. This is detrimental to passing seabirds because they are attracted to the bait as the lines go out from the boat, but are quickly pulled down with the line and drown. 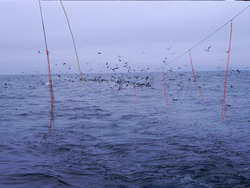 Seabirds are attracted to the fish that are caught by trawl nets and the scraps that fishermen discard at the surface . Birds are especially vulnerable at the surface when trawl nets are being deployed (or the shooting) . This period of slacked rope allows the birds to attempt to catch fish and they then become entangled and drown as the net sinks . Seabirds can also collide with the cables, or warps, that drag the trawl net. This is called warp strike . This mortality is hard to identify since drowned birds possibly sink to the bottom, leaving no evidence . It has been observed that birds are at risk for warp strike when there is offal discharge from the trawling vessel and in the absence of this discarded offal, birds tend to avoid the dangerous area close to the trawl cables . Large-winged seabirds, such as Albatross, tend to forage aggressively and with their wings outstretched, so they are at more risk of colliding with warp cables than smaller birds . Calm conditions reduce the probability of collisions because heavy weather causes the cable to cut in and out of the water at faster speeds . Depiction of a bottom trawl. Trawling can also occur in the pelagic zone of the water, where the net is pulled along behind the boat, instead of dragged along the bottom. Fishermen and scientists are beginning to work together to find solutions to the bycatch problem. The National Oceanic and Atmospheric Association (NOAA) Fisheries National Seabird Program is committed to addressing a multitude of seabird issues, not just bycatch. Their focus on bycatch is to reduce the direct takes of seabirds by fisheries and understand the effects of declining seabird populations . Simple streamer lines deter birds from feeding on baited hooks by essentially scaring them away from the line, similar to how scarecrows are used in crop fields . When used correctly and in suitable conditions this method can be extremely effective in reducing seabird bycatch. In the North Atlantic, experimental trials showed that streamer lines resulted in a 98% reduction in seabird bycatch . When paired streamer lines are used in Alaska, they have the potential of reducing some fulmar and albatross bycatch by 88-100%, however, shearwater bycatch rates remained the same due to their diving abilities . Streamer lines are also more effective when more lines are used . In several demersal long line fisheries, where seabird bycatch is at high risk, such as Alaska and Heard Island, paired streamer lines are required . Many diving birds can still reach baited hooks when they are submerged, and streamer lines may not always deter them, so it is best to use streamer lines along with other forms of mitigation, such as line weights . Streamer lines have also been shown to reduce seabird bycatch in trawling nets . By introducing streamer lines to the demersal finfish trawl fisheries in the Falkland Islands, there was an observed 90% reduction in seabird mortality . Since these streamers hang from the cables of the trawl, they also efficiently scare birds from the cables and cause less collisions . Longlines can be weighted to allow the weight to sink to greater depths more efficiently . As mentioned earlier, the best practice for reducing seabird bycatch is to use weighted lines in combination with other measures . There are two types of weighted lines, integrated lines and external lines . Integrated lines, or the Autoline system are lines that have a weighted core that allows them to sink faster rather than just a fishing line by itself . External weights are just weights that are added to longlines . In some New Zealand trial experiments, the improvements of sink rates to 20m depth have resulted in a 95% reduction in Whitechinned petrel mortality and a 60% reduction in sooty-shearwater mortality . In the Northern Hemisphere, longline fisheries have also shown that integrated weight lines are effective at reducing seabird mortality, especially when paired with streamer lines . Though streamer lines can help to prevent warp strike in trawl nets, the key is offal and waste management since the main reason birds are attracted to trawling vessels in the first place is the discarded offal . By prohibiting the release of waste before and during the shooting and hauling of the nets, fewer numbers of seabirds will be attracted to the trawling activities . Seabirds have also been shown to be attracted to offal discharge in longline fisheries as well as trawls . Net entanglement in trawls becomes an issue when the net is slack at the surface for long periods of time, so reducing this surface time can help to reduce seabird bycatch . One way of doing this is to add weights to the cod end of the net, along with net binding, which ensures the net does not open at the surface . Weighting the causes it to sink faster, decreasing the amount of time that the net is at the surface, so fewer seabirds get stuck in the mesh when they try and catch yummy fish. The International Plan of Action (IPOA) for Reducing Incidental Catch of Seabirds in Longline Fisheries and The Agreement on the Conservation of Albatrosses and Petrels (ACAP) . The International Commission for the Conservation of Atlantic Tunas (ICCAT) was set up in 1969 to conserve tuna in the Atlantic Ocean . This commission also compiles data from member states and figures out management advice relating to bycatch and target species . They also passed a recommendatoin that longline vessels south of 20 degrees South should use bird-scaring lines to reduce incidental catch . These objectives found that there is a clear overlap between ICCAT longline fisheries and seabird distributions and 37 species of seabird have been recorded as bycatch in ICCAT fisheries . This assessment allows fishery councils and management to utilize bycatch reduction tools and seabird avoidance gear to reduce the numbers of birds that are incidentally caught . The fisheries in Alaska run by NOAA have gear limitations (regulations 679.24(e) and 679.24 9(b) (2)) that require them to use seabird avoidance gear, for example, the owner of a fishing vessel must have hooks that sink as soon as they are put in the water and they must discharge of offal in a manner that distracts birds from the baited hooks . These are among many limitations and requirements for fishing vessels. The Magnuson-Stevens Fishery Conservation and Management Act also has information on what fishermen are required to do about bycatch . Section 316 of the Magnuson-Stevens Act outlines the major objectives of the North Pacific Council in reducing bycatch . 12/3/2011. Bird Web. 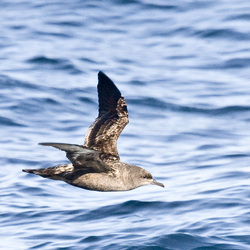 Sooty Shearwater. Seattle Audubon Society <http://www.birdweb.org/birdweb/bird/sooty_shearwater>. 12/3/2011. Castro K, Williams E. 2011 11/26/2011. Bycatch. Sea Grant Rhode Island <http://seagrant.gso.uri.edu/factsheets/Bycatch.html>. 11/26/2011. 12/3/2011. National Geographic Animal Facts. National Geographic <http://animals.nationalgeographic.com/animals>. 12/3/2011. 11/27/2011 NOAA Fisheries. NMSF Alaska Region <http://alaskafisheries.noaa.gov/protectedresources/seabirds.htm>. Accessed 2011 11/27/2011. Tuck GN, Phillips RA, Small C, Thomson RB, Klaer NL, Taylor F, Wanless RM, Arrizabalaga H. An assessment of seabird-fishery interactions in the Atlantic Ocean. Ices Journal of Marine Science 2011;68(8):1628-1637. Winter A, Jiao Y, Browder JA. Modeling Low Rates of Seabird Bycatch in the US Atlantic Long line Fishery. Waterbirds 2011;34(3):289-303.